In the spirit of William Joseph Chaminade’s vision of community and diversity, St. Mary’s University played host to the interfaith, intercultural tradition of the International Prayer for Peace (IPP). Beginning 27 years ago in Assisi, Italy, the community of Sant’Egidio and Pope John Paul II first organized IPP during the height of the Cold War with the objective of bringing people of various faiths together to communicate a common interest: peace. Since then, the event has been held annually in Europe. In 2011, the 10th anniversary of September 11, marked the first year the IPP was brought to North America to be held in conjunction with the event overseas. This year, the sister event took place in Rome. The movement came to St. Mary’s, where it saw one of its largest crowds since it has been held in North America. 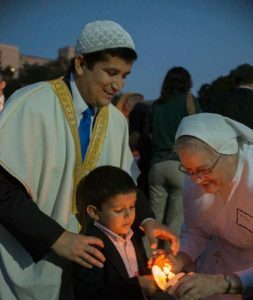 In the heart of San Antonio’s Westside, about 800 Muslims, Jews, and Christians united in solidarity to foster communication and learn from one another. Messages of pilgrimage, justice and peacemaking resonated throughout the arena during presentations and breakout discussion sessions led by Rabbi Elisa Koppel, Imam Sohaib Sultan and Andrea Bartoli, Ph.D., of Sant’Edigio. In her presentation on “Human Mobility and the Power of Place,” Koppel described the pilgrimages of the Jewish people, in their quest to reach the Promised Land, noting that because “sanctity is a matter of human declaration” her people have always had places to perform ritual. And that many aspects of her religion came from absorption of the different cultures Jews found themselves living in. “Pursuing justice as a common good is not as easy as it seems, nor is it as complicated.” As a global society we must allow our fears to dissipate because we have much in common that we can pursue, according to Sultan. Speaking on “The Role of Religion in Conflict and Peacebuilding,” Bartoli described the sometimes violent struggles within and between religions, citing intra- and inter-religious assassinations of prominent individuals who fought for peace, and also provided the audience with different interpretations of religion. The event concluded with a candlelight vigil beneath the bell tower, where Archbishop Garcia-Siller read the same declaration of peace that was presented in Rome, and then invited all in attendance to sign it. St. Mary’s would not have had the opportunity to host this event if it wasn’t for St. Mary’s interim Graduate School Dean Aaron Tyler, Ph.D., who is also director of the International Relations graduate program. For the last few years, Tyler has attended IPP events throughout Europe where he befriended members of Sant’Edigio. That led to St. Mary’s having the opportunity to host this global event.